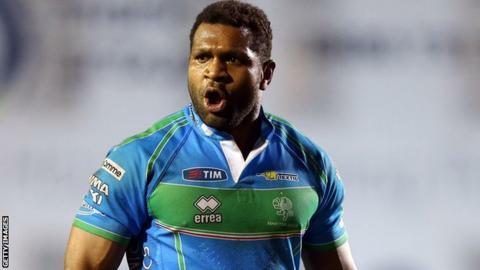 Cardiff Blues have signed powerful back-rower Manoa Vosawai from Treviso for next season. The Fijian-born Italian international will replace Irishman Robin Copeland, who has signed for Munster. "First of all I would like to thank God for my life and the many blessings in it," said the 14-times capped number eight. "Secondly I would like to thank Benetton Treviso for the last four years of my career." Added 30-year-old Vosawai: "Now there's a new page in my life and I am grateful that Richard Holland and his team has given me the opportunity to be part of the Cardiff Blues family. "Cardiff are a top side with rich heritage and tradition in rugby and I know that they will bring out the best in me. It is an exciting time for me and I'm looking forward to putting on the Blues jersey next season at the Arms Park." Blues have also signed New Zealand international lock forward Jarrad Hoeata, Exeter prop Craig Mitchell, Scarlets flanker Josh Turnbull, Gloucester scrum half Tavis Knoyle, Bristol wing George Watkins and Dragons back row Ieuan Jones. Chief Executive Richard Holland said: "We are delighted to be in a position to now confirm, after much speculation, that Manoa will join the Blues next season. "He is the latest addition to the exciting squad we are building for next year and beyond. "Manoa is keen to make a huge impression in Wales and we would like to thank the WRU [Welsh Rugby Union] for its support over this signing. "We will now complete the visa process as we prepare to welcome Manoa to Blues in the coming months."